I’ve played a lot of Destiny 2. It feels great to play. The guns are snappy. Running and jumping around the environments is smooth. It is an incredibly well-made game—except the story. Both on a macro and micro level, the writing in Destiny 2 is often half-baked, bordering on nonsensical. Or worse, cheesy. A cardinal sin for a game that takes its space opera world-building so seriously. But I wish they’d focused on those strengths a bit more when crafting an E3 demo. 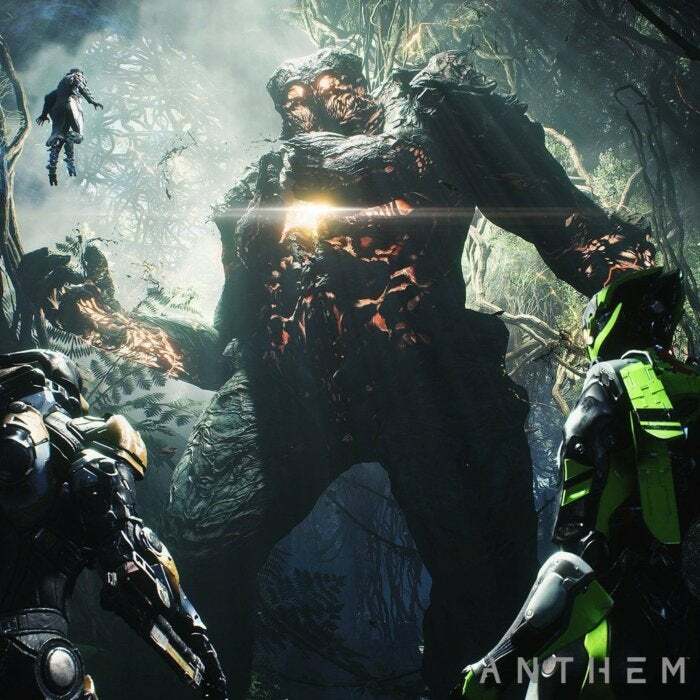 Here’s the thing: Anthem ($60 preorder on Amazon) plays great. We were forced to use an Xbox One controller for our demo, even though we were running at 4K on a PC, with a mouse and keyboard sitting mere inches away. Frustrating. Even on a gamepad though, Anthem is a blast. The mission we played is the same one EA showed off during its EA Play event earlier this week, a four-person co-op adventure that took us past gleaming waterfalls, through a bandit camp, underwater, and finally into the lair of an enormous alien spider. None of it is exactly “unique.” I mean, giant spider boss? Come on. But Anthem is a joy to control, especially flying around in your Javelin mech suit. You’re incredibly mobile: jumping, then transitioning into flight, hovering in mid-air to fire a few shots, flying forward again, diving underwater, then exploding out of a lake on the other side and soaring upward again with water droplets falling around you. Destiny’s movement (with maybe the exception of the Warlock’s jump) feels great. Anthem feels better. It’s a movement scheme that seems geared toward making exploration fun, and that’s a good start. There’s obvious Mass Effect: Andromeda and Dragon Age: Inquisition DNA in Anthem, which makes sense—that’s where BioWare started with these huge open-world areas. But both those games were a chore to chart, mostly just watching your character walk across empty spaces. 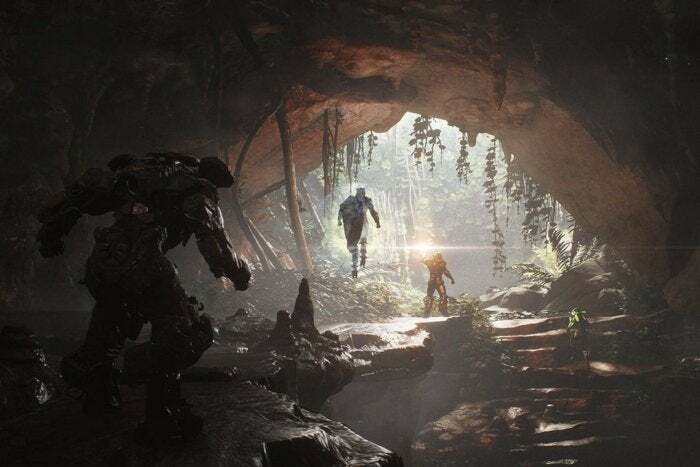 At least in Anthem you’re jetting down cliff faces, weaving in and out of caves, and generally having a great time just holding the left stick forward. Combat in Anthem is also pretty tight. It’s not the best shooter I’ve played, and some of the smaller guns feel impotent. On the other hand, explosions are huge, and some of the heavier weapons are really satisfying to wield. My mechsuit also had a powerful ability that let me shoot wave after wave of missiles, like Overwatch’s-Pharah-as-directed-by-Michael-Bay. I had a lot of fun hammering that giant spider boss with it. Devastating. It plays well. I had a good time with it. 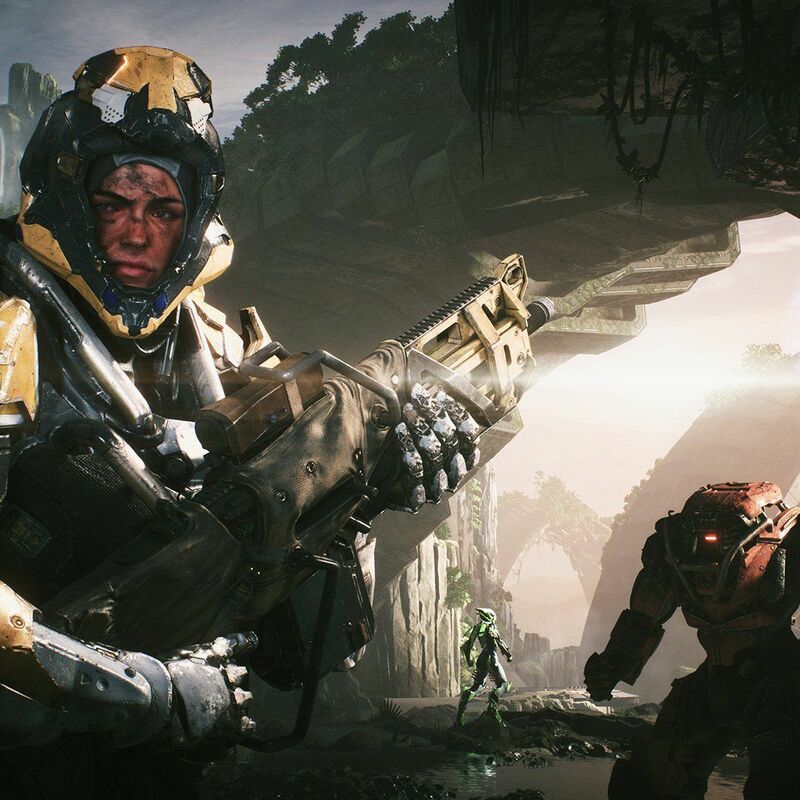 We only played a few small segments of a much larger mission, but I could see getting three friends together and mindlessly blowing apart some mobs in Anthem. Absolutely. But why? And I guess this is where I’ve been stuck on Anthem ever since I played it. As I said: To beat Destiny 2, it seems like the smart money is to double down on story—to make your universe one worth exploring. This being BioWare, I’m willing to extend the benefit of the doubt. I’m sure there’s a story to Anthem, or at least that a lot of thought’s gone into designing the universe in which it exists. None of that comes through in the E3 demo, though. The opening cutscene, the same one we saw during the EA Play presentation, is…empty. It’s a procession of generic characters, all calling you “Freelancer” and spouting off platitudes about the upcoming mission. In other words, it feels like Destiny. And that’s all we saw. EA did mention there are collectible lore drops that populate missions, but that seemed like half a solution in Destiny, and it doesn’t feel any better here. It’s so transparently game-y. Is there more to it? Can BioWare actually hook me? I honestly don’t know, and that’s a problem because story is the only thing I care about with Anthem. It plays fine? Great. Now tell me what it’s about, and tell me why I should sink 100-plus hours into another Destiny-style game. Tell me why I should ditch Destiny to gather loot in your world. Tell me it’s better than Mass Effect: Andromeda’s thin plotting. Most of all: Tell me why BioWare is making this game, because what I played feels like it could’ve been made by a dozen different studios. Don’t consider this a write-off. I’m interested to see where Anthem goes. It’s immaculately produced, and I really did enjoy my 30-minute slot with it. Flying. Is. Great. And more games should give me the sort of mobility I have in Anthem. It’s a blast. But like The Division 2, I’m left disappointed. E3 demos are, at their core, a way to sell press on the idea of a game. That’s problematic sometimes, as people put their best foot forward to win press over and then fumble the full game. Theoretically you’re playing to your strengths though, demonstrating what makes your game special, why people should care about it in—frankly—a market that’s too crowded for anyone to care about every game. When you’re showing me a brand new BioWare game, I’d expect someone to say, “story is our strength,” and want to highlight that. This E3 demo just doesn’t. All I know, after 30 minutes of shooting, is that it plays about on a par with Destiny. It’s hard to feel particularly inspired by that, even if nothing I saw was technically bad. Anyway, as I said: Don’t write Anthem off yet. I’ve been surprised before—I still remember when I played my first Wolfenstein: The New Order demo back in 2013 and came away expecting the game to be a disaster. Instead, it’s an all-time favorite of mine. These short, highly-focused E3 demos are far removed from actually playing the game. 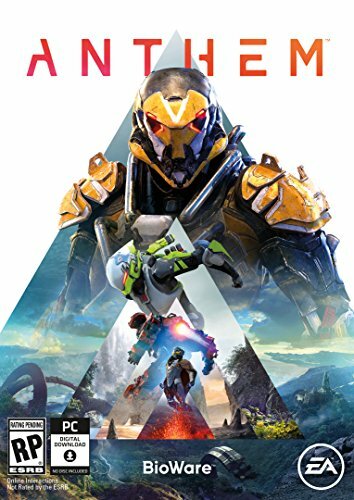 I just hope Anthem actually feels like a BioWare game when it finally releases next February. They can pivot into open-worlds, pivot into shooters, but when I hear “BioWare” I expect a thrilling and complex story I can sink hours into. If that’s not the case here, I’ll be disappointed. 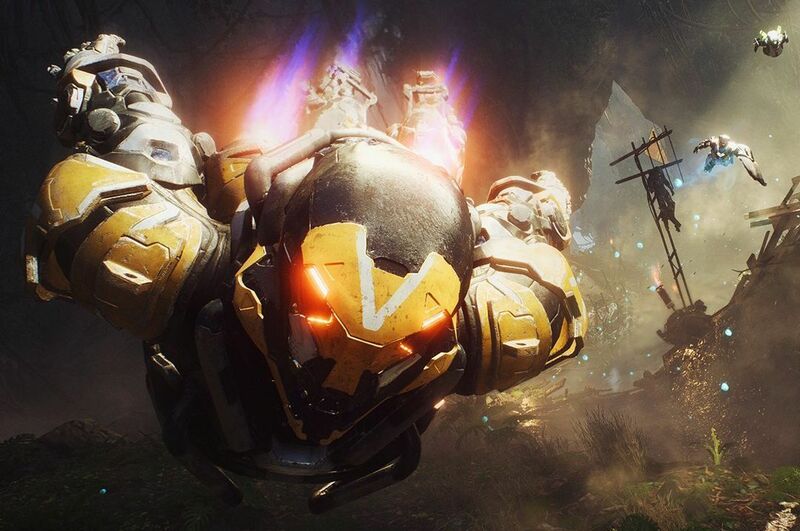 Anthem handles like a champ—but so does Destiny.